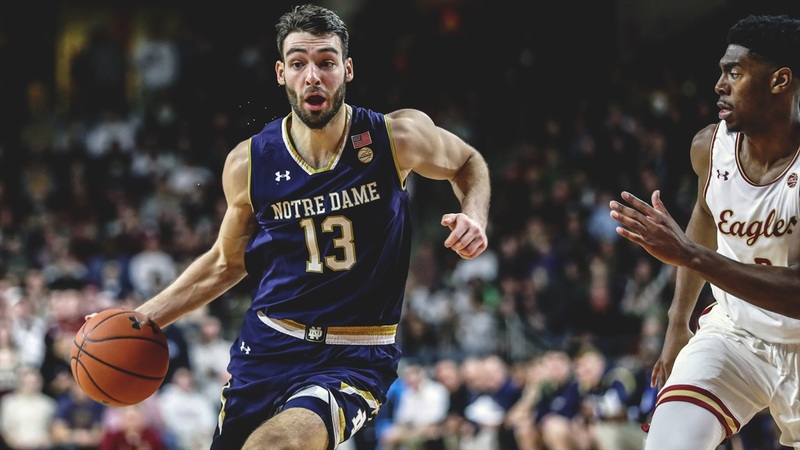 Notre Dame needed a spark offensively, and they got it against Boston College on Saturday in the 79-73 win over the Eagles. The Irish have been in what had seemed to be in a never-ending slump over their last five games. The last time they came out victorious came against the Eagles in Purcell Pavilion on January 12th. 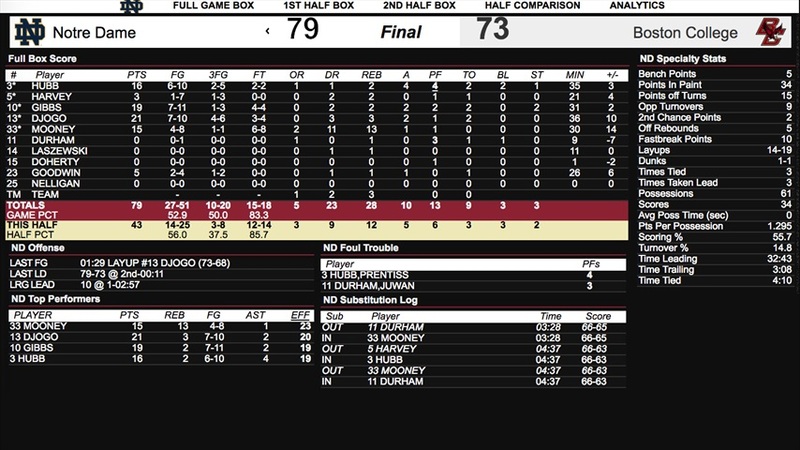 The Irish hadn’t shot 50 percent from the field in a game since the win over Jacksonville on December 20th, but Notre Dame shot 53 percent (27-51) from the field against the Boston College inside Conte Forum. The offensive outburst was sparked by Nikola Djogo who scored a team-high 21 points, which is also a career-high for the junior. “I’m thrilled given how we were thumped at home by two great teams,” said Notre Dame head coach Mike Brey. “For us to bounce back and win a league win - I think Boston College is really playing well. They are really gifted offensively. Notre Dame recorded its second ACC win (2-7) and improved its season record to 12-10 on the year. 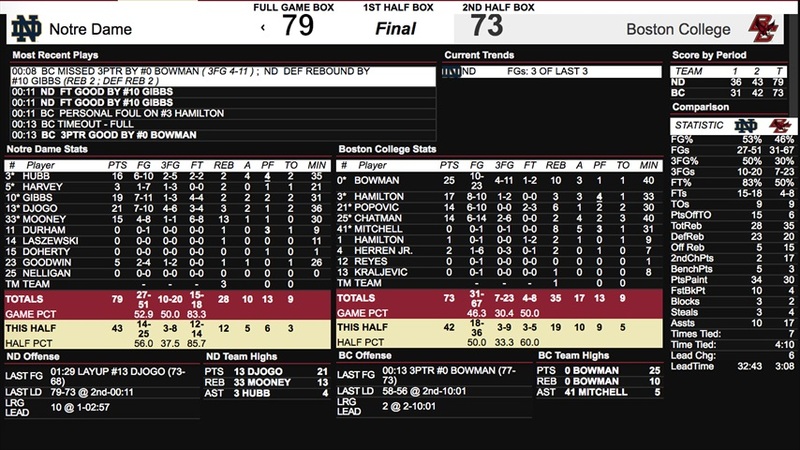 Boston College dropped to 11-9 on the year and 2-6 in ACC play. With 2:47 left in the game, Boston College junior Jared Hamilton rose up from the right corner and hit a three-pointer to pull his team within one, 69-68. Moments later Notre Dame captain TJ Gibbs got into the lane and finished a contested layup. This was followed by a Djogo layup on the Irish’s next possession to give them a five-point lead with 1:29 left in the game, 73-68. This forced an Eagles timeout. Out of the timeout, Boston College missed two chances to score and was forced to foul. Gibbs hit both free throws to extend the Irish lead to seven, 75-68. Gibbs scored 17 of his 19 points in the second half and went six-for-six from the free throw line down the stretch to close out the win. The junior also became the 63rd player in program history to score 1,000 career points with a layup in the second half. John Mooney recorded his eighth consecutive double-double with 15 points and 13 rebounds. Boston College shot 46 percent from the field and only 30 percent from long range. The Eagles were led by Ky Bowman who scored a game-high 25 points. Hamilton, Nik Popovic and Jordan Chatman each scored in double-figures as well with 17, 14 and 14 respectively. Djogo started the scoring with a layup on Notre Dame’s first possession of the game, but it was countered quickly by a Bowman three-pointer. However, Djogo moments later hit back-to-back three-pointers to give the Irish an 8-2 lead. “A lot of it was about how well he played and competed against Duke,” Brey said of why he gave Djogo the start. “He played 20 minutes against Duke. I thought he really competed. I felt we needed his energy. He’s older. We have a younger and inexperienced team. We’ve played a lot of the freshmen, but he was a little bit of an older guy tonight. I thought it helped us out there. “He’s athletic as heck. He is a big and long defender. He helped us defensively and he can rebound. He’s a big, athletic guy. We put him in the game early at North Carolina and he traveled twice in like a minute. We didn’t go back to him and I thought his confidence was hurt. My confidence in him was hurt. The Eagles went on a 7-0 run sparked by three consecutive buckets by Chatman, Hamilton and Bowman. They tied the game at 16 until Gibbs snagged the lead back for the Irish with a contested layup with 11:55 left in the half. With six minutes to play in the half, Boston College cut the lead to one, 20-19 after Jarius Hamilton hit one of his two free throw attempts. After the free throw, Notre Dame went on an 11-2 run to extend its lead to double digits. DJ Harvey rose up and hit a three with 2:57 to give the Irish a 31-21 lead. The Eagles battled back and cut the lead to just five going into halftime, 36-31. The 10-5 run to end the half by Boston College was sparked by a three-pointer by Chatman, a layup by Popovic and five-points by Bowman. Notre Dame shot an efficient 50 percent from the field in the first half (13-26) and an even more impressive 58 percent from long-range (7-12). The Irish were also able to score 11 points off four Boston College turnovers. Djogo and Prentiss Hubb combined for 24 of Notre Dame’s 36 points in the first half with 14 and 10 respectively. Djogo hit three from deep and Hubb added two. Boston College shot 42 percent from the field in the first half (13-31). However, the Eagles couldn’t get anything going from three-point range (4-15). Bowman led the Eagles offensive attack with 13 points on 5-for-11 shooting. “We’ve had great games with them,” said Brey. “We’ve been fortunate to be on the good side for a while now. I was on the plane thinking the law of averages might kick in because we’ve beaten them for a while. We escaped again. Any league win you can get, especially for our group, is good for us.